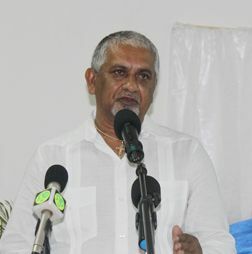 Speaking at the annual prize giving ceremony of the St Vincent and the Grenadines Cricket Association (SVGCA) recently, at Murray Heights Hotel conference room, Bullock suggested that the cost of running cricket tournaments should be rethought. âIt is untenable to have an event where officiating costs account for more than fifty per cent of the budgetâ¦ It is something that must be addressed and addressed with some urgency,â Bullock said. âWe cannot continue to equate local domestic cricket with international cricket â¦.We have to sit down at the table and work out a middle ground,â he noted. The National Lotteries Authority is the title sponsor of the premier and first divisions of the national cricket programme as well as the Neil Williams Twenty/20 Competition, which is also under the aegis of the St Vincent and the Grenadines Cricket Association. âWe must work together as sponsors, the Cricket Association and the stakeholders in cricket to ensure the cost of operating these tournaments,â Bullock advised. Plans are in train for a national softball cricket showdown in 2015, in which the two top teams from the several competitions across St Vincent will compete. Head of the interim national softball association â Israel Bruce, disclosed at the closing of the Greiggs Softball Cricket Competition, that the winner of the national competition would receive $10,000.